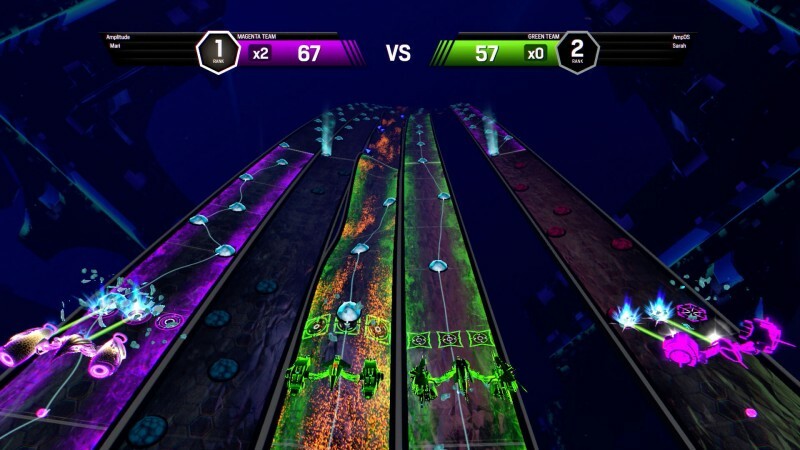 "Harmonix Goes Back To It's Roots Thanks to Kickstarter"
The majority of gamers remember Harmonix as the developers that started the Guitar Hero franchise and then took it a step further with the Rock Band series. Back in the early PlayStation 2 days, they made two cult classics Frequency and it's sequel Amplitude. These rhythm games didn't have a peripheral bundle, so you had to press a lot of buttons on the controller to clear instrumental sequences. 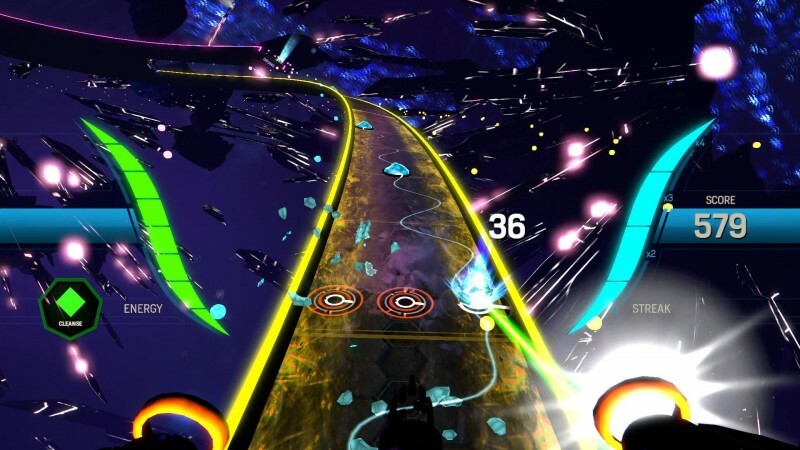 Thanks to a successful Kickstarter campaign a couple years back, Harmonix has released a "remake" of Amplitude with new songs made in-house and unlockable ones from indie games. The Kickstarter budget definitely was a factor to how light the content is, but the content there is satisfying enough for fans of the original games and newcomers that are curious about how Harmonix started their rise. For those unfamiliar with Amplitude, the goal is to perfectly clear tracks of instruments by pressing the corresponding buttons. If successful, the track is cleared for a bit as the song plays that certain portion and you have to transfer to another one quickly to keep your multiplier above if you're going for high ratings. These tracks can be drums, synths, vocals, bass and guitar in some songs that have riffs. One mistake and that track has to be completed all over again. Think of the gameplay screen as a freeway full of lanes and you have to be perfect to move on the next lane. Lane management is pivotal to high ratings and survival on the higher difficulties especially going in blind to a track far away from the one you just completed is the most frustrating thing gameplay-wise in this game. Harder difficulties definitely test your reactions and actions per minute, but just like Rock Band, completing an intimidatingly hard sequence is as satisfying as nailing a difficult guitar solo. Powerups are also found in the tracks to help things out if you're in a jam. Cleanse clears a track temporarily for you than pressing the necessary buttons, sedate slows down the song and very useful for harder tracks, flow clears all sequences for a limited time and multiply increases the score of every note you complete. They can also be used to regain a lost multiplier when you mess up instantly, which is another key tactic when going for high ratings. However, clearing a set of notes to get a powerup while having another one stored does overwrite so management of these are also pivotal to success. The gameplay as a whole is still pretty fun just like the early 2000s or if you have played Rock Band Unplugged or Rock Band Blitz, which are similar games to this under the Rock Band umbrella. The single player component besides quickplaying any of the songs in Amplitude is surprisingly a campaign mode. There's actually a story of sorts in this campaign where you have to reawaken a patient's brain from playing fifteen songs to completion. The fifteen-song campaign is treated as a concept album by Harmonix since they worked on the majority of them, so it's nice that there is a cohesive theme with the pacing of intense beats and going mellow to chill things out. In each of the three sections, the fourth song is portrayed as a boss level and in certain moments you have to keep a streak alive to increase the chances of the patient's brain being reawakening. Plus, these songs have no powerups, so it's all honest skill especially in harder difficulties. The fifth song of each section has to be unlocked by performing well in the other four songs collecting at least ten bars (three is the highest in each song). The campaign does require you to beat all fifteen songs to get a good ending and especially on expert if you want to unlock the Super difficulty. It does get challenging around halfway into advanced and expert because of absurdly tough tracks that require great reactions and reflexes. With fifteen more unlockable songs along with just quickplay and campaign, there seems to be not enough to keep solo players going besides going for top scores on the leaderboards, but there is local multiplayer in this 2016 version of Amplitude. All of the songs can be played with up to four players in competitive or team formats. There's even multiplayer-only powerups that can benefit on the team aspect and even mess up opponents when playing competitively. Unfortunately, there's no online play with the multiplayer modes just like last year's Rock Band 4. The lack of content is because of the Kickstarter budget, but I'm still glad that this game exists in it's current state and good to come back if I just want to knock out some songs before continuing on with my day or night. I also wanna mention the controls in this game where there's multiple control schemes for multitudes of players. The default scheme felt fine to me in which the L1, R1 and R2 triggers are the note buttons and also the face buttons as a backup option. Other schemes are for left handed players and even one handed players, but I wish there was a flat out in-game button configuration as seen in fighting games. I wanted to try out my Mad Catz TE2 FightStick, but I didn't find a control scheme that felt friendly to the stick's buttons. If there was a scheme with square, triangle and R1 as my note buttons, then I'm set on performing those difficult sections better than the Dual Shock 4. Frequency fans will also be happy about the unlockable FreQ mode when the track highway is a tunnel just like that game and that's actually easier for players to navigate to far away tracks without being blind not knowing what the first note is at times. Amplitude does look great on the PlayStation 4 with it's psychedelic visual style and also acid trip vibes in some songs. There is a moment in the end of the campaign where the visuals go epileptic, so for those that don't like epilepsy, you are warned. The soundtrack can be hit and miss for fans wanting more of the original songs to come back in this new version, but I thought it was fine. The campaign has it's standouts and unlockable songs from various indie games such as Crypt of the Necrodancer, Skullgirls and Transistor are nice inclusions as well. No licensed songs as seen in Rock Band Blitz is a bummer and Harmonix hasn't said much regarding more songs as DLC, but I do wish there's more songs out in the future because the 30 in the game ain't gonna be enough for most folks. 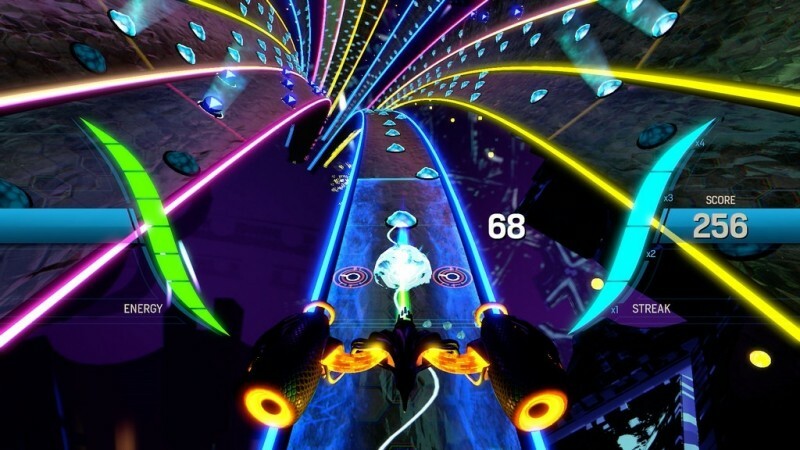 For $20, Harmonix's Amplitude is definitely a love letter to fans of those original games gameplay-wise. Along with the visuals, the whole gameplay experience feels awesome especially on harder difficulties if you got the quick reactions and reflexes to nail those tough sequences. The campaign having some sense of story is surprising and challenging for players. The lack of content, online multiplayer and no plans yet of DLC does sting the overall package a bit, but what's there is great enough for fans that waited years for a new rhythm game reminiscent of Frequency and the original Amplitude. Who knows what's next for Harmonix after releasing Rock Band 4 and the Kickstarter-backed Amplitude, but I hope they keep going on making rhythmic experiences that satisfies fans and innovate the genre even further.